This page contains information of general interest to line dancers and past "editorial" comments which appeared under the announcements and news heading. I must've thought you'd always be around. Now you're nowhere to be found. That I can't sing I can't help listening. There's nothing you can do about it anyway. Until the dance becomes your very own. You never know will be coming down. May lie the reason you were alive but you'll never know. ONCE UPON A TIME, there was a man who was—let's say, a bank manager. He was favored by the bank directors because he had some of his own money invested in the bank, and he was always willing to work late. One of his duties was to consider loan applications. 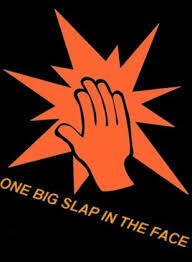 He took great pleasure in wielding his power and turned down many, MANY requests, often belittling and ridiculing the loan applicants just for his amusement. In this way he inflated his sense of self worth. Then one day the Wheel Of Fate clicked forward, and the bank manager found himself in need. He had to ask the very people he'd humiliated for their help. They treated him as he had treated them. He went away, never to be seen again. And everybody lived happily ever after. Here are some 2017 numbers Peter compiled. Still to come are my license fees to BMI, SEASAC, and ASCAP which allow me to play music legally in class. This will be between $350 and $450 for calendar year 2018. I am only one of about 20 VOLUNTEER line dance instructors here in The Villages, and all of us are happy to spend our time preparing for class and dancing with you. ﻿WHAT IS A "STARTING WALL"? This is a term I use often in class. Let's assume that we begin a dance facing the front wall, or 12:00. This is where I stand when I teach, with my back to the class and all of us facing forward. When we complete the dance pattern we are facing a different wall, and we begin the pattern again. Although the new wall (and subsequent walls) are, in effect, "12:00" as we dance the pattern, it would be too confusing for me to call that new wall either "12:00" or the "front wall," because those terms are so strongly associated with the ACTUAL front of the room. So for clarity, when we start the pattern from the beginning on all subsequent repetitions of the pattern, I refer to each of those as the "starting wall." Think of it as VIRTUAL 12:00 (still with me?). Here's an example. Cupid Shuffle is a 4 wall dance. When we finish the 32 count pattern we are facing 9:00, where we repeat the pattern. That makes 9:00 our "starting wall" FOR THAT REPETITION OF THE DANCE. In effect, you DANCE as though you're facing 12:00, and I think everybody understands that. Quiz: in this example still using Cupid Shuffle, where's your next "starting wall"? ﻿Recently I received this extremely complimentary email from another instructor about a specific dance. "I wanted to let you know how much I enjoyed your class today. Your teach...was EXCELLENT!!!! I had watched the videos and had a couple of questions in my mind...and boy oh boy, you definitely cleared up any questions I had. Now I just need a whiteboard...it was amazing how much that visual helped too.... After your class, I now feel comfortable teaching it...."
I am deeply distraught to learn that yet ANOTHER class has started opposite one of my existing classes. This is especially devastating because I recently changed the format of that class to accommodate what I understood were the preferences of the majority of students. When I moved to The Villages, instructors were careful not to tread on each other's classes because we respected each other. We also were careful about limiting socials to 1 per quarter each, and scheduling them so they didn't conflict with those of others. It's sad that this no longer is true. I have a million things to do today but had to write to you. Not sure if your ears were burning last night but I was sitting outside with [friends] singing your praises, explaining the difference between instructors (because I get frustrated sometimes) - trying to explain that Lisa “dances” and doesn’t just do steps. By definition, waltzes are written in ¾ time and are counted 1-2-3, 1-2-3 with one beat per quarter note. They come in two types: fast waltzes and slow waltzes. The term "Viennese waltz" is taken from the world of ballroom dancing and defines a style, NOT a tempo. Therefore, it is incorrect to label any LINE DANCE as a "Viennese waltz." Music in 4/4 meter can include triplet rhythms, where 3 eighth notes occupy one beat. When written as four groups of triplets in a measure, this can sound like a waltz to the untrained ear. The same can be said for 12/8 meter where every group of three 1/8th notes receives an accent on the first eighth note, and the phrasing of the music or lyrics is felt in patterns of four. That constitutes many cases of what has been termed "rolling rhythm." 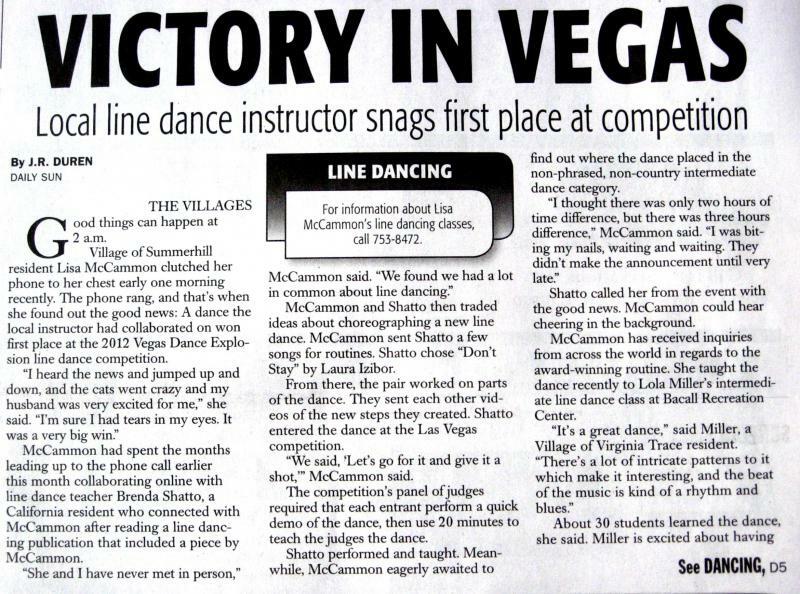 The line dance "Rolling Rhythm" choreographed by Michele Burton and danced to Girl Crush is a perfect example of the correct interpretation of the music style, and is correctly labeled. To more easily identify a slow waltz, listen for the heavy beat on count 1 of the first measure and a lesser accented beat on count 1 of the second measure. (As we would count in line dancing, the heavy accent is on beat 1 and the lighter accent on beat 4.) That corresponds to the stepwork of country couples waltzes, with the heaviest accent on the man's left foot. Remember: tempo does not determine the style of a dance. A Viennese Waltz is a ballroom style, and does not apply to line dance. Unfortunately, many line dance choreographers do not understand this. A good site to check for dance speeds is: Tempo Recommendations for Dance Music - Hollywood Ballroom Dance Center, LLC You will note the source references are reputable organizations. Thank you, Norman! As most of you know, I discuss the difference between waltzes and rolling 8 rhythms when I teach. I play music of both meters, and we listen to the timing, rhythm, and how the lyrics coincide with the counts. Here's an oversimplified method that line dancers of any level can use. While listening to a song that you think may be a waltz, do some familiar waltz steps: forward and back basics, twinkles, etc. If you feel graceful and the dance steps flow, the song is a waltz. If your dancing feels frenetic and rushed, and you find you need to add holds or sweeps for 2 counts to MAKE it feel "waltzy," then chances are good that the meter is a rolling 8. For those of you who are new to The Villages and don't know the background, I began teaching here by splitting the year with Carol Simmons, who started the Monday (Hibiscus) and Wednesday (Pimlico) evening classes many years ago. My "term" is roughly May-October, and Carol's is roughly November-April, with a little overlap at each end due to her travel schedule. Although amenities fees allow residents to attend any free class any time with no obligation, regular participants in various activities often choose to show their appreciation of their volunteer instructors by contributing to a group purse. Usually this occurs during the holidays. Because Carol teaches during "the season," any gifts from the Monday students are presented to her in December, even though we split the year. A couple of years ago, some of my students came up with the idea of celebrating my September birthday, which occurs during my "term" at Hibiscus. These friends put out a card for my students to sign, and collected any contributions for ME in recognition of the time and effort I put into those two classes for six months. I only celebrate my September birthday in the Monday class because I am not there during the holidays. "To me, dancing is a full body experience which involves your HEART and SOUL as well as your feet. Yes, line dance choreography offers a prescribed sequence of steps, but within those sequences we should all feel free to add our own interpretations without encroaching on another's dance space or causing harm to anyone else. "Have you ever watched Jo Thompson Szymanski or Rachael McEnaney or Rob Glover or Roy Hadisubroto (just to name a few) 'play' with a line dance? It's mesmerizing and joyful and inspiring. "So, yes, please, let's be cognizant of dance floor etiquette. Let's also remember that line dancing should be FUN. Sometimes in the eagerness to join a dance floor, people don't realize they're crowding someone else. If you're that stressed out about someone moving into "your" space, then move to another space. I do it all the time. And sometimes I even sit out a favorite dance because the floor is just too full." Here's the original thread from Talk Of The Villages. I associate line dancing more with an aerobic exercise class or a Zombie apocalypse than dancing. As a non line dancer, but an avid observer, if the zombies would only smile, laugh, or even pretend they enjoy line dancing, one could tolerate the music that line dancing is done to. I see nothing wrong with line dancing: good exercise, promotes mental acuteness, etc. But nobody looks happy. No interaction between participants. No smiles. It's actually pretty boring watching it, and the look on the faces of the individuals Line Dancing they all look like they lost their best friend or worse yet about to face 20yrs to life. Is this the impression we want to give? Granted, for the most part these comments refer to people dancing on the squares, where dancers have to concentrate to keep their footing on uneven surfaces and also avoid the "happy hour" dancers, kids, and dogs underfoot. If you dance on the squares, I hope you'll keep these comments in mind, and try to convey the enjoyment you derive from line dancing. Yes, we concentrate or count when we try to remember the steps. But we don't have to LOOK like we're in pain, right? When (not if) we make mistakes, it's not the end of the world. Nobody's going to throw us out of class or ban us from the square. Remember what I say in class--the mistakes don't show in your feet, they show in your FACE. If you're smiling, anybody watching thinks either you're perfect or that the mistakes don't bother you, which should be true! Whether you're in class or on the squares, don't worry so much about the steps that you forget to smile and have fun. 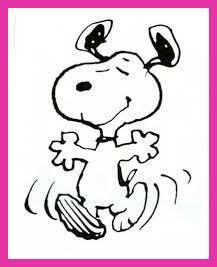 Be like Snoopy--make every dance a happy dance! I'm sure that all of my students have heard me talk about the benefits of line dancing, which is great physical and mental exercise: what could be better than moving to music in a relaxed and happy environment among friends? I also remind my beginners especially to smile and get to know the people dancing next to you--wearing a name tag is a big help. Once you've been going to classes for a while, you are familiar with the faces of the other dancers on the floor, and it's obvious when a new person joins the class. Be friendly and helpful if you can, and make a point to smile and say hello. Recently in an intermediate class, I noticed a couple who came in late. He sat and watched, but she found a spot in one of the front lines and gave it a go. She didn't know the dances, but she picked up most of the steps and did as well as the rest of us when a new dance was taught. After class I introduced myself and asked if they were new to The Villages. Their names are Tania and Frank, they live in Belgium, and they were renting a house near Spanish Springs for a month. We chatted for quite a while after class and I gave them my card so they could email me. I was pleased that they did, and I told them about other classes and activities. They tried to do a lot in their time here, and had a busy schedule which also included trips to Orlando and St. Pete, and hosting visitors of their own. While they were here, we went out to breakfast and lunch, and after class we and two other students went to World Of Beer at Brownwood. Frank encouraged me to try a Belgian brew, which was delicious. Kickit is a step sheet archive website. I have used it for many years, and have been a longstanding subscribing member. When choreographers submit their step sheets for publication on Kickit and click "agree" to the terms and conditions, they authorize Peter Blaskowski, who runs the site, to make any changes he deems necessary. In 2012, Peter decided that all step sheets posted on his site would be correct--according to HIS idea of correctness. "Both of these dances appeared before October 1, 2012, which is when I started curating the line dance archive, rather than just dumping into it whatever was sent me. I now care about accuracy and precision in step sheets. So dance rhythms are identified correctly, language is converted to a standard simple vocabulary, similar rhythms are displayed in a single format, misspellings and typos are removed, counts match the number of steps shown, etc. "If someone wants to just look at a ton of step sheets, he or she can visit any online step sheet website (all of which originally built collections by simply grabbing the entire un-curated Kickit collection). If he or she wants accuracy, precision, and consistency, then Kickit is the place to go. "Working backward through all of the old step sheets before October 2012 is a huge task. I have been able to automate some of the updates, but, by-and-large, step sheets added before then are going to be left to languish forever. Realistically, 99.9% of them are never viewed or danced anyway, so it is hardly worth anyone's time to go back and update old step sheets." Interesting use of the term "dumping." To me, that indicates that he considers our step sheets to be garbage. While I support consistency in terminology and simplified language, the fact is that step sheets are the intellectual property of the choreographers, so they should have the final say on how their step sheets are written--especially since copyrights (such as they are) only apply after publication. Sure, a typo here or a wrong direction notation there should be corrected. But it doesn't stop there. How do I know? Because I DID NOT SUBMIT THAT STEP SHEET TO KICKIT, and therefore I never agreed to his terms and conditions. Peter Blaskowski APPROPRIATED my step sheet from another site, edited it, and posted HIS version on Kickit WITHOUT MY PERMISSION. If he did it to me, I must assume he does it to others as well, and in fact, I have heard from several choreographers who have said they NEVER send their step sheets to Kickit, and yet all of them appear in his archive. Therefore, I do not trust step sheets that appear on Kickit and do not use any that are posted there. Furthermore, I never send my step sheets to Kickit. If you have one of my step sheets with the Kickit logo, it should be destroyed because it may not contain the choreography I wrote.